Cotton intercrops such as corn, sorghum, beans, and peanut create a natural balance of pests, natural enemies, and weeds in the cotton field environment (FAO, 2001). Corn or tobacco planted in every 20 rows of cotton attracts cotton bollworm (Hasse, 1986; 1987). Sunflower or cowpea sown in every 5 rows of cotton attracts moths when planted as trap crops. Castor attracts caterpillars (CIKS, 2000) and okra attracts cotton flower weevils when planted as border crops. Rice when rotated with mungbean and cotton disrupts the life cycles of pests attacking these crops. However, the timing of planting of intercrops, trap crops, and border crops should be properly observed because these crops must flower at the same time with cotton (Hasse, 1986; 1987). To maintain soil organic matter, liberally apply or incorporate plant residues and animal manure during land preparation. Apply basal fertilizer, thinly covered with soil, along the furrows before planting for the hill-drop planting method. For dibble planting, dibble the fertilizer 5-8 cm away from the seeds just after planting or within one week after emergence. Make sure the fertilizer does not come in contact directly with the seeds. Between 42-47 days after planting (DAP), sidedress fertilizer in band 3-5 cm away from the plant base, then hill-up immediately to cover the fertilizer with the soil. This method minimizes loss of N through volatilization. If the soil is dry, irrigate immediately after hilling-up to dissolve the fertilizer. Fertilizer recommendations based on soil analysis provide the very best chance of getting the right amount of fertilizers without over or under fertilizing. Ask for assistance from local agriculturist office. Off-barring and hilling-up should be done if minimum tillage without mulch is employed, especially in areas where weeds are prevalent and furrow irrigation is practiced. At 22-27 DAP pass a spike-tooth harrow in between the furrows. Practice off-barring or hand hoeing 35 DAP. Inter-tillage cultivation during the growing season controls weeds, provides good aeration, and hastens water infiltration during rainfall or during irrigation (CODA, 2002). The Australian Cotton Research Institute develops Enviro-feast, a food supplement for beneficial insect species in cotton. It is an attractant as well as food source to sustain beneficial insects between pests' outbreaks. It attracts a wide range of beneficial species including lacewings, ladybirds, big-eyed bugs, and damsel bugs and works well in combination with lucerne intercropped with cotton. Field trial results indicated that when used against Helicoverpa species in cotton, the number of synthetic insecticide sprays reduced drastically without lowering the yield (Cabweb, 1997). A team of scientists of Cotton Development Administration (Philippines) has discovered Bacillus cereus, nitrogen-fixing bacteria found in the roots of Cenchrus echinatus (Sandbur). B. cereus isolated from the roots of C. echinatus can be used as microbial seed inoculants to improve cotton seedlings vigor. 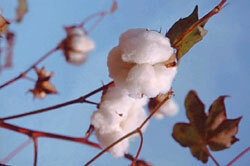 Experiments showed that seed inoculation with B.cereus lessened by half the recommended nitrogen requirement of cotton. A further study is needed to make better microbial formulations and that will make B. cereus easier to store and handle. B. cereus can be freeze-dried and formulated as powder or as liquid concentrates since bacteria develop spores (Barona, 2003). Barona, L. (2003): Bacteria in weed as biofertilizer for cotton. BAR Today. Department of Agriculture. Manila, Philippines. Vol. 5 No.2. CODA. (2002): Steps to successful cotton production in the Philippines. Cotton Development Administration, Quezon City, Philippines. Youdeowei, A. (2002): Principles of integrated pest management: Growing healthy crops. Integrated Pest Management Extension Guide 1; Series editors: A. Cudjoe and M. Braun; Ministry of Food and Agriculture, GTZ and CTA.